Recently, I’ve started looking at the anime industry and seeing what drove me to anime in the first place... Hollywood. Some of that could be down to having a couple of decades of familiarity with the medium under my belt now, but really it does seem to me that anime is becoming more and more reliant on franchises, remakes and continuations in a way that it wasn’t even ten years ago. Even in the ‘original’ genre shows that get made now, there is a reliance on clichés and story tropes that register within a few minutes of the opening credits, and can turn you off the new thing in just as little time. 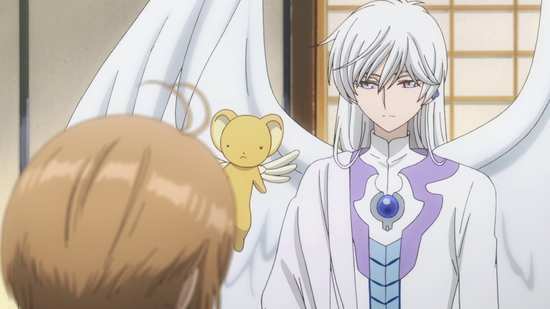 Gundam is ever present of course, but this year, we’re getting a remake of Fruits Basket, Dragon Ball Z’s Super series is going strong, Sailor Moon got a continuation a while back, and now I’m taking a look at Cardcaptor Sakura: Clear Card, which picks up where the original series left off 20 years previously. Of course the big problem is that the original series never had a UK home video release to my knowledge. Hopefully this run is standalone enough not to require too much prior knowledge. Previously, Sakura Kinomoto opened the wrong book, and unleashed the Clow Cards on the world. With the Guardian of the Clow Cards Keroberos, she undertook a mission to retrieve those magical cards, and gain their powers. It wasn’t easy, but she had the aid of her best friend Tomoyo, and the enigmatic Li Syaoran, a boy with powers of his own. Now, Sakura is starting middle school, and Syaoran is coming back from Hong Kong. Life couldn’t be much better. But an ominous dream precedes all of the Cards turning blank, their powers lost. Strange things are happening again, and this time, only Sakura can sense the magic. Another dream gifted her with a new key, and she has a whole new set of cards to collect. The first eleven episodes of the series are presented across two discs. The show gets a 1.78:1 widescreen 1080p transfer on these discs, which is clear and sharp, with strong consistent colours. Take the classic late nineties character designs and give them modern production values and animation, and you have a show that looks delightfully retro and cutting edge as well. The show is a bright, colourful affair aimed at younger audiences, so dark atmospheric scenes aren’t too common here. It also means that digital banding is practically absent. This show looks excellent in high definition and a couple of flashback sequences let you compare it to the original as well. You have the choice between Dolby TrueHD 5.1 Surround English and 2.0 Stereo Japanese, with subtitles and signs locked during playback. The audio is fine, the actors are suited to their characters (the Japanese cast returning after 20 years), and what I sampled of the English dub seemed fine. The show gets some really nice theme tunes, the action comes across well, and the subtitles are accurately timed and free of typos. The sole extra here is the Cardcaptor Sakura Clear Card Prologue – Sakura and the Two Bears, which runs to 26:42. 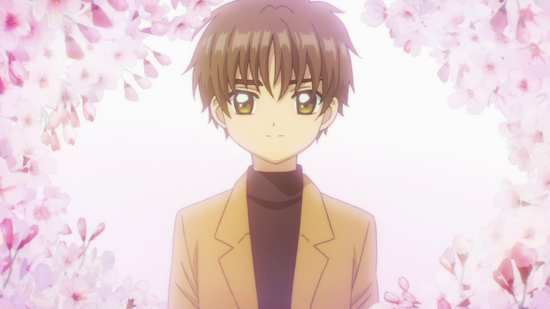 This episode bridges the gap between the end of the first series and the start of the second, and develops the relationship between Sakura and Syaoran. Disc 2 has a commentary on episode 9 with Jason Liebrecht (Syaoran), Monica Rial (Sakura), Natalie Hoover (Tomoyo), and Michaela Krantz (Kero). You also get the texted credits (locked subtitles aren’t what I call textless). 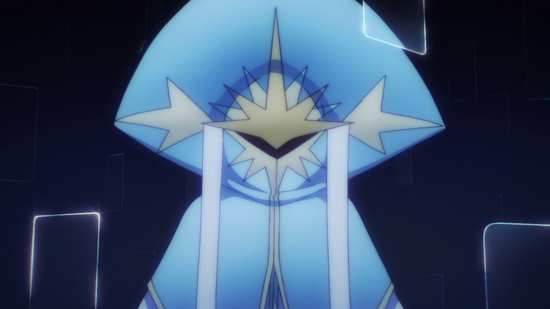 Cardcaptor Sakura Clear Card Part 1 got rated PG for a mild fantasy threat. Remember Star Wars, Uncle Owen and Aunt Beru got turned into charcoal skeletons and that was a U. This is a PG. I have to rant about this as Cardcaptor Sakura is that rare anime release in the UK, it’s a kids’ TV show. 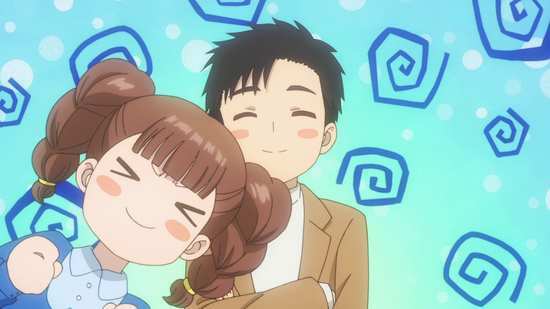 The anime that we usually get in the UK is aimed at pre-teens, teenagers and adolescents, while the odd show will appeal to the older demographic, but shows like The Adventures of Mini-Goddess, Panda Go Panda are the exceptions. For once we get an anime show that can safely be shown to young children, and the BBFC still think that they need a parent holding their hand lest the magical cards get too scary. 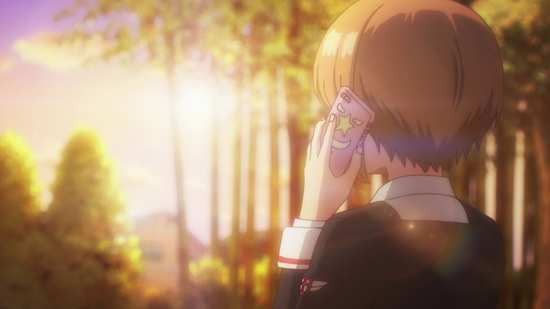 The slight annoyance is that a prior knowledge of Cardcaptor Sakura is probably useful, as this story does refer to earlier events and characters from that show. 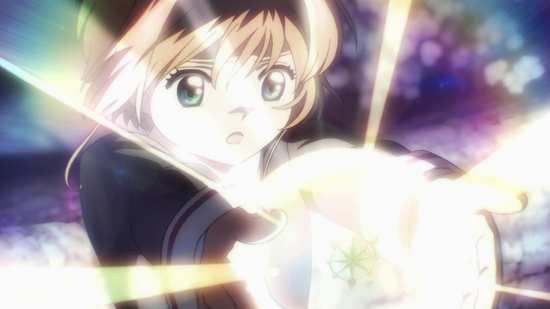 In the UK, our only other anime encounter with Sakura, Syaoran et al was through the aborted release of Tsubasa Reservoir Chronicle, the first season of which came out via Revelation. It’s another story universe that uses the same characters in different roles. Thankfully, the manga of the original Cardcaptor Sakura is readily available, so you can get caught up in print form. At its heart, this is really a television show aimed at the younger demographic, and I have to admit that I found its simpler characterisation and narrative, its repetitive episodic format to be just a little tiresome. It’s not a show that I can binge watch. After the Sakura cards turn clear and powerless, the show settles into a routine of domesticity among friends, interrupted once an episode by a moment of mild peril, which would entail Sakura turning into the magical girl necessary to deal with the danger and capture the next new card. Inevitably, capturing the next card would entail using the powers bestowed by capturing the previous cards, and as the pantheon grows so do Sakura’s abilities. What the show has to its advantage are the characters. Sakura and Syaoran form a likeable couple, taking the first self-conscious steps in first love, a whole lot of awkward glances and blushes. One thing about Sakura’s magical girl powers is that it’s really only the staff. 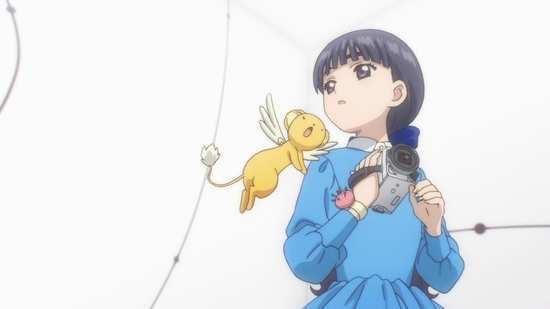 It’s her best friend Tomoyo; her biggest fan who tailors all her magical girl outfits and makes sure she’s properly dressed for the occasion, and insists on filming all her adventures for posterity. Sakura’s home life is pleasant, with her father an occasional presence when he’s not at work, and an obnoxious but lovable, and loving older brother. There are plenty of antics to be had with the other kids at school, and midway through this collection, a new transfer student, a girl called Akiho arrives and joins Sakura’s circle of friends. No doubt she and her magically endowed butler Kaito will have greater import as the series unfolds, but not in this collection. 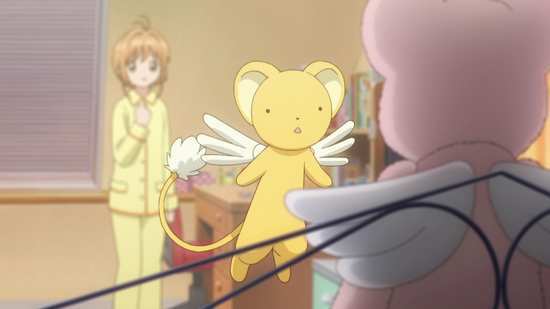 Of course no magical girl show would be complete without a mascot animal to supply comic relief, and Sakura has a winged lion named Kero who spends most of his days as a stuffed toy, but can transform into a full on mythical beast when required. It really does feel like a slice-of-life show for the most part, a group of friends just enjoying their lives together, and once an episode we get some magical girl action when a new card has to be secured. It’s never scary or intense, usually just a logical challenge to face, as to which power to use to get the new card. There is the mystery of the whole thing, the dreams that hold meaning for Sakura, the question as to why the original cards vanished, and what the new cards mean, and there is the odd inkling that people like Syaoran, Sakura’s brother Toya, and their friend Eriol know more than they’re letting on. No doubt this will be clarified as the series progresses. One oddity might be the anachronistic feel to the show. Cardcaptor Sakura was very much a nineties show, and Clear Card follows that story a few months down the line. 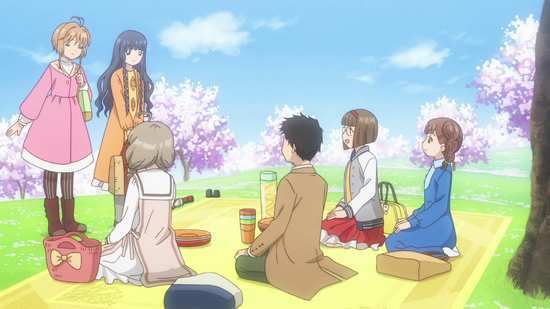 Yet now, everyone has a smartphone, and Tomoyo is filming Sakura with drone cameras. Sure, the show feels current, but the continuity causes a few raised eyebrows at times. 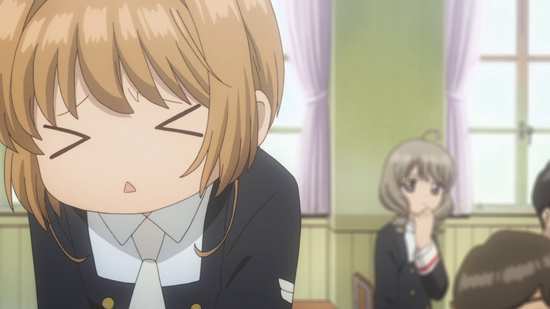 Cardcaptor Sakura is aimed at that younger demographic, and as a reviewer of a certain age, I find that I have a lot less patience for shows that appeal to younger children. Clear Card skirts that boundary between pure kids TV, and kids TV that adults can enjoy as well. It’s just a little too saccharine, and doesn’t have enough of an edge for my tastes. 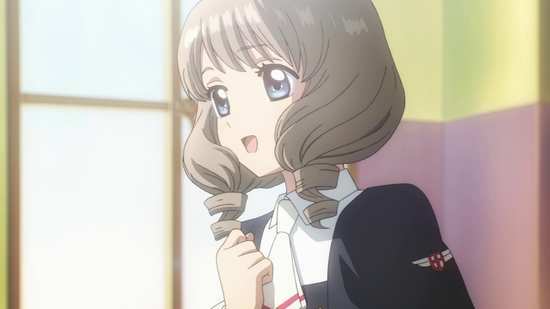 But if you have nostalgia for the original Cardcaptor Sakura, or are enacting a master plan to get your kids hooked on anime at an earlier age than normal, then this show is a great idea.